Pinterest is an ocean of life-saving solutions and tricks. It has made our lives easier in every aspect. Our favorite area to browse is obviously the Hair & Beauty section. We can spend hours just scrolling and re-pinning makeup and hair looks, nail art, and other inspirations. We put together a list of the coolest, most interesting beauty tips and tricks on Pinterest. Happy pinning! Unless your pimples are giving you a major headache, we didn’t think there was another way to use them for our skin issues. But this pin says you can use these painkillers as a zit zapper by opening up the gel cap and applying it on the pimple. It will get rid of any swelling. There’s no need to purchase a special brush cleanser when a few kitchen items will get the job done. This pin tells us to mix a tablespoon of white vinegar in a cup of hot water and soak for 20 minutes. We love this pin for its link to a variety of nail cures. 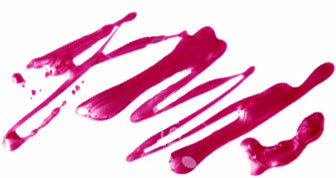 Our favorite is this nail soak solution that helps get nail polish stains off your nails. Now you don’t have to go crazy about removing dark polish and getting it all over your skin (hate that). Here’s another pimple cure. Dab some honey on your blemish and top it off with a Bandaid. “Honey kills the bacteria, keeps skin sterile, and speeds healing. Works overnight.” How sweet! Check this pin out for other household saviors! Dr. Oz knows his stuff. This pin shares his remedy for whitening teeth without having to buy a kit. Mix ¼ cup of baking soda and lemon juice and apply it on your teeth with a Q-tip. Cheap and easy! There’s nothing better than letting an image do all the talking. What’s easier than just copying this chart to get a perfectly contoured, Kim Kardashian complexion? Save your next Tic Tac box to store your bobby pins. No more fussing around trying to get a pin from the bottom of your bag. Get ready for strong and healthy nails! This pin brings you to an interesting tutorial for making your own nail strengthener with gelatin. There isn’t a single nail issue that this pin doesn’t conquer. We especially can’t wait to try dunking wet nails into a bowl of ice water to make them dry faster. Life-changing! Get your shopping lists out. This list of yummy foods pinned from The Beauty Department will get you on your way to a clearer complexion.